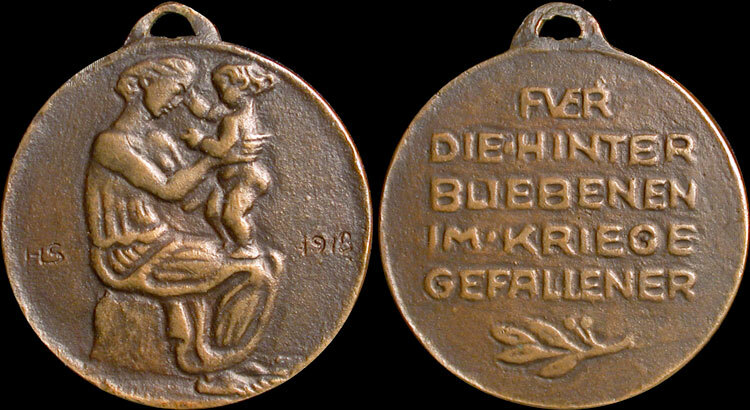 Hans Schwegerle - 1918, Cast Bronze Medal with integrated loop, 30mm, 25.6g., Rim-punch: six clover leaves at 3:00 o'clock. Hasselmann 157. Mother, seated right, holding a standing young child on her lap. HS to left, 1918 to right / Medal created to be sold to benefit widow's and children of the fallen. Only 28 pieces cast in Bronze.